When I first moved out of home, I didn’t really know how to cook. I struck a deal with my housemate that he’d drive me to and from work, if I did the cooking. Sounded like a pretty sweet deal to me! Except for the whole cooking thing, due to the not knowing how. That was a pickle. So, I walked into a supermarket, I picked up a food magazine and chose an appropriately show-offish recipe. I labored over that meal for hours (I had zero knife skills), and at the end of it all, narrowly avoided giving my new housemates food poisoning with semi-raw chicken. Uh, whoops. Sorry team! Let this be a lesson for all of you: Don’t run before you can walk. Basics are basics for a bloody good reason. Even now, I find myself realising that while there are many things I can do (yay me! ), I know very little about the basics. They’re worth knowing. So here we are, at Italian. 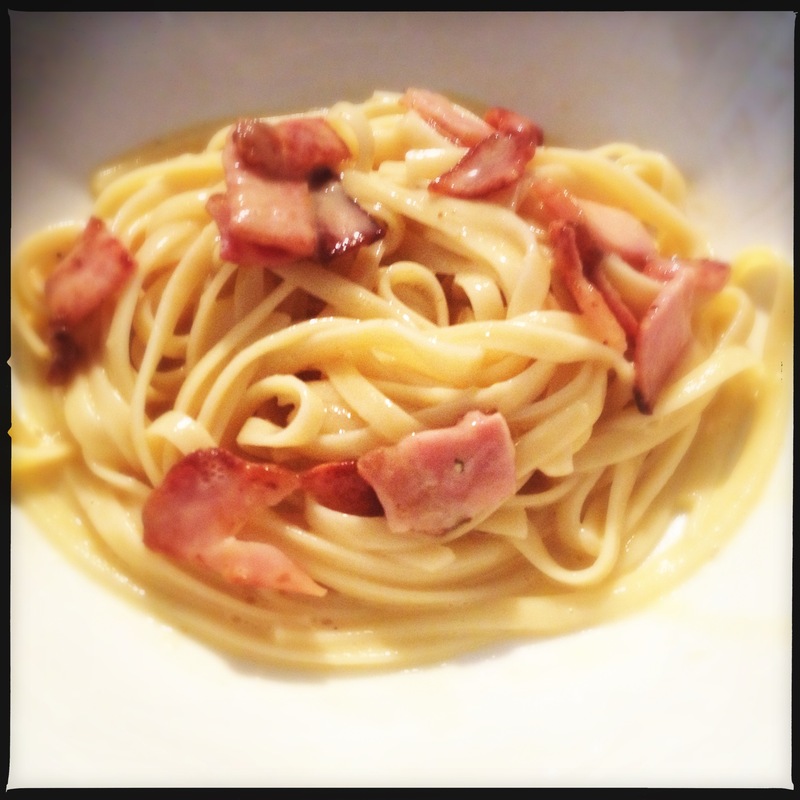 Namely, carbonara. 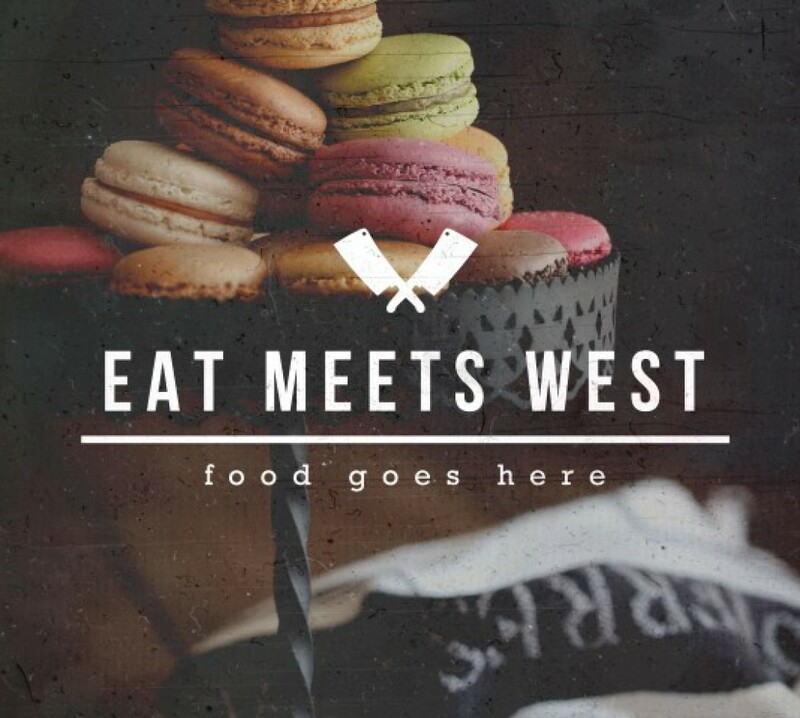 Turns out, it’s nothing like that gluggy, clumped together mess that you get served in all of those restaurants along the cappuccino strip in Fremantle. It’s silky, delicate, and actually cream free, if you do it right. Today’s recipe isn’t super traditional, there is cream in the mix, but there’s nothing wrong with breaking from tradition. If you want the whole experience, try this. If you’re a champion multi-tasker, you can have this on the table in less than 20 minutes. Eat that, Jamie Oliver! In a large pot of salted boiling water, cook the pasta according to instructions. While the pasta cooks, heat the oil in a pan, and cook the bacon or pancetta for a couple of minutes, stirring. Toss in the garlic and stir for a further 30 seconds, then set aside. 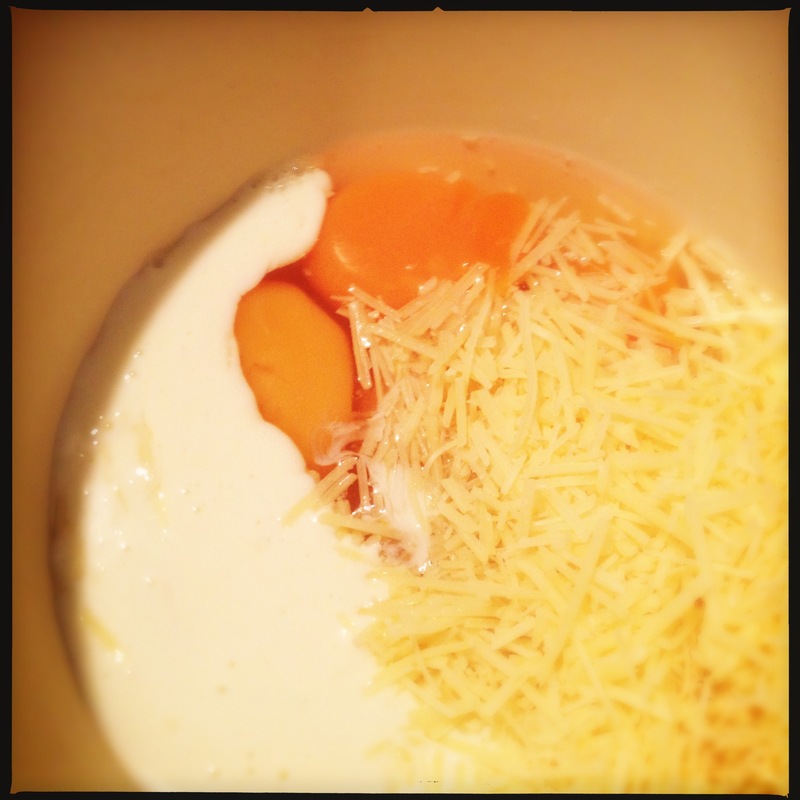 Whisk together the eggs, extra yolk, parmesan and cream and season with salt and pepper. Drain the pasta, return to the pan and then quickly pour over the egg mixture. Toss together with the bacon and parsley, and serve. Advice for those playing at home: Keep the sauce off the heat when you’re mixing it with the pasta. If you cook the sauce too much, you end up with scrambled eggs, and that’s just not cricket. Jerk, and learning the hard way. Have you even had one of those moments where you discover (usually in a highly embarrassing social setting) that you have known/been doing something wrong your whole life? I have a friend who genuinely believed unicorns existed, and that they were just extinct. You know, like dinosaurs. Or another friend who thought polony came from the ground, like peanuts. One who thought leprechauns were just midget Irish people. He learnt he was wrong the hard way, in a pub on St Patrick’s day, with a punch to the face. I had someone tell me it was weird that I brush my teeth in the shower. Still do it though. I consider it efficient. Don’t even get me started on the argument on whether toilet paper hangs over or under on the holder (for those of you playing at home – it goes over. What is wrong with you?). If there’s anyone left who didn’t know (join my support group – we meet at the bar), get yourself a digital meat thermometer. They’re cheap, and actually rather handy contraptions. Chicken, when pierced through its thickest part, should be about 80*c or 170*f when cooked properly – no more dry chicken. Booya. 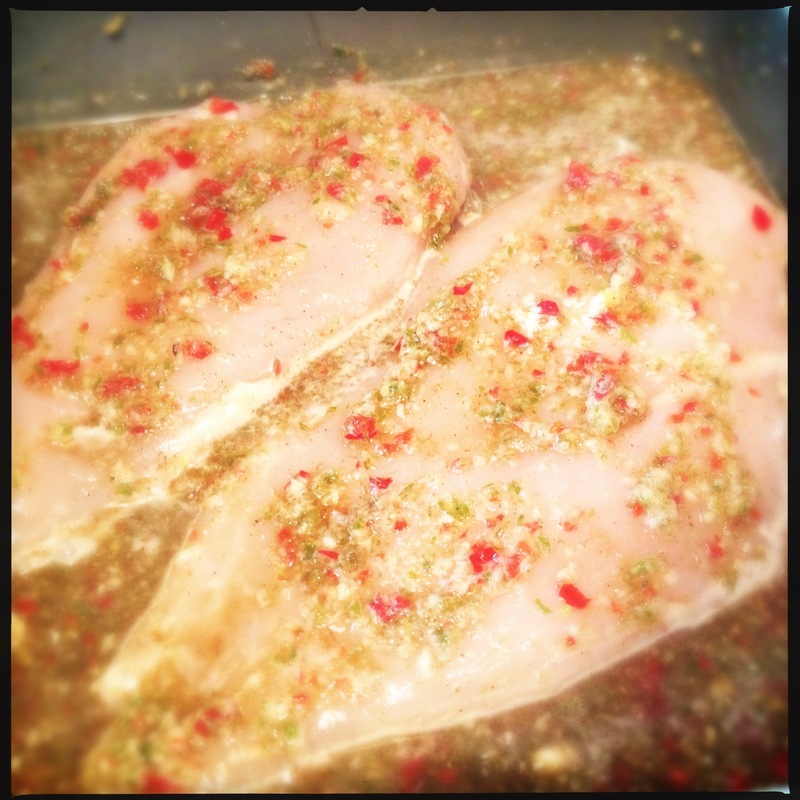 Heat the oven to 220*c.
Drizzle chicken breasts with olive oil, season with salt and pepper and give them a good rub all over. Place the chicken in a frying pan on high heat. To make the sauce, trim and chop the spring onions and throw them into a blender with thyme, bay leaves, 6 tablespoons each of the rum and vinegar, 1 of honey, 2 teaspoons of salt and a large pinch of the cloves, nutmeg and allspice. 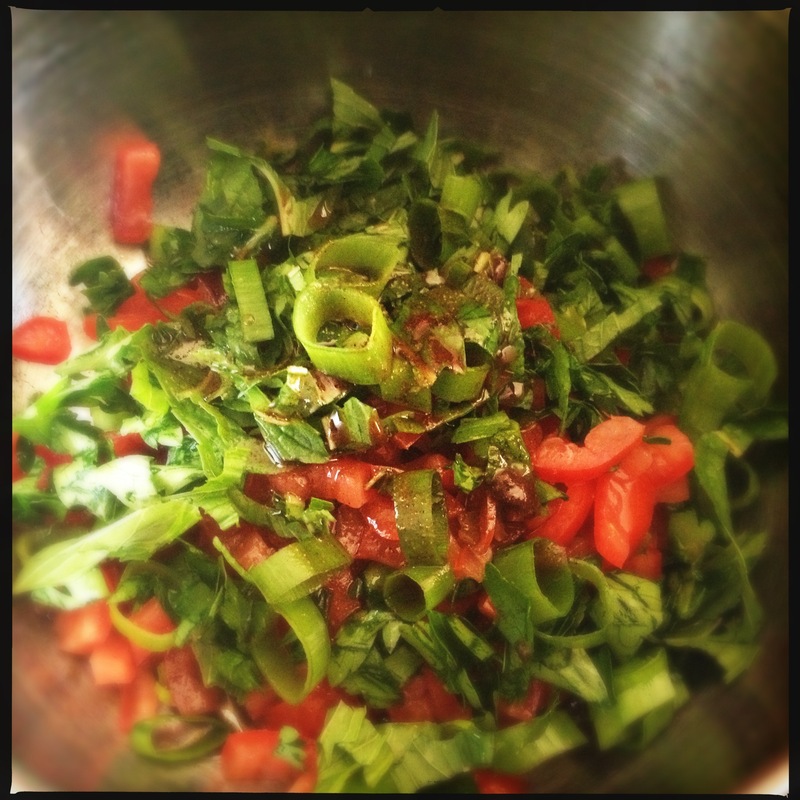 Remove the top and seeds of the chili, then add it to the blender. Lastly, crush and peel the 4 garlic cloves, add them to the blender, then blitz until smooth. Add some more olive oil if it needs it. By now, the chicken should be golden. Pour the sauce into a baking dish, then place the chicken on top, golden side up. Pour a tablespoon of honey over the top of the chicken, then bake in the oven for 15 minutes or until the thickest part reaches 80*c with a thermometer when pierced through the thickest part. Cook couscous according to instructions (or, add equal parts couscous and boiling water, plus a little chicken stock for taste into a heatproof bowl, cover with cling wrap and let sit for 10 minutes. Fluff with a fork once cooked). 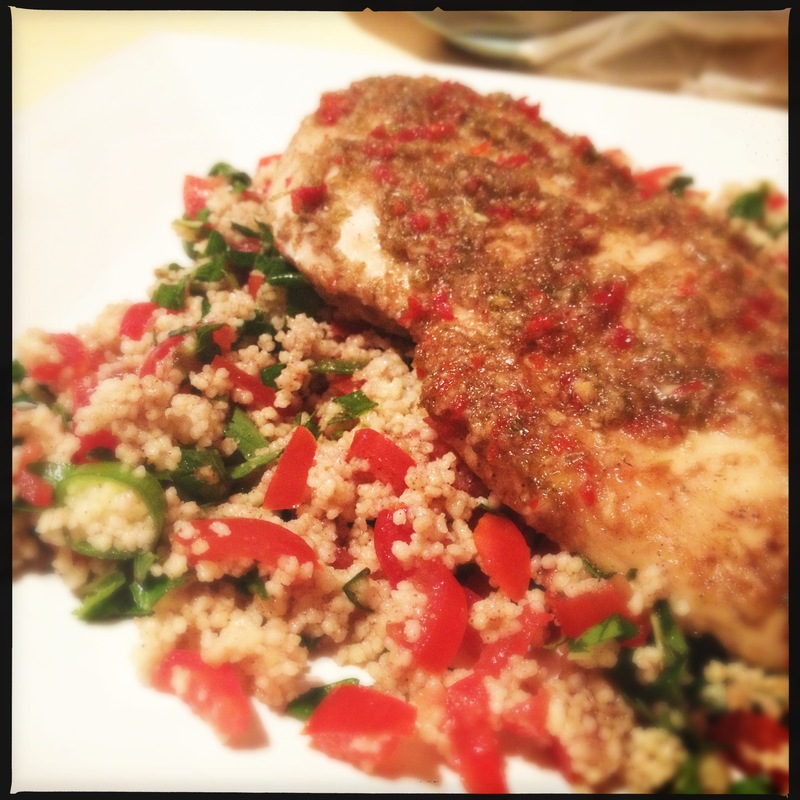 Chop the herbs and tomatoes, and mix all of the ingredients, including the couscous together. Season with salt and pepper. 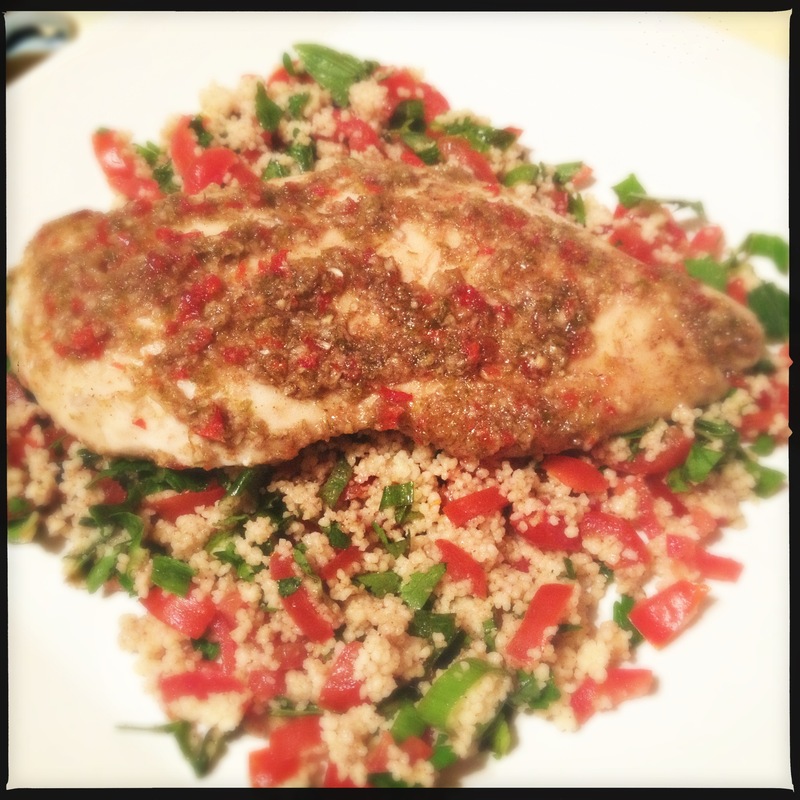 Note: If you don’t have bulgur, don’t worry about it too much. And for the herbs… Just use whatever you have. Don’t worry so much about the ratios. It all works out in the end. Welcome back, by the way. How was your Christmas and New Year? What did you eat and do? I’d love to hear about it!